As I discussed in the last post, Sparta evolved a military society in part because it needed the capability to control the Messenian Helots, an enslaved underclass. This subjugation of a neighboring people was unusual in antiquity because the Messenians were cultural peers and not a beaten enemy or foreign race. Sparta had limited arable land and, as it grew, it began to covet the fertile land of its western neighbor. It first invaded Messenia in 735 B.C. and was victorious, but did not subjugate its victims. A second war erupted in 670 and, this time, the Messenians were able to hold out for twenty years before being forced to surrender. The end of this war corresponds with the time period of the reforms of Lycurgus, signaling the onset of the Spartan military state. The enslaved Messenians became known as helots meaning “those captured and made to become prisoners”. This new social class in Sparta, was distinguished from slaves who were considered property. Now Helots were forced to till plots of land for their Spartan overseers. Half of the profit from the harvest went to the Helot and the other half was given to Sparta. Some 9,000 of these individual farms were put into operation. Over time, the Helot workload was expanded to include all manual labor required to run the Polis, releasing the Spartan men for full time military training. The subjugation of the Helots was ruthless. Each fall, when the newly elected Ephors took office, they would start with a proclamation to all Spartans, “shave your moustaches and obey our laws”, followed by a declaration of war against the Helots. The war declaration extended martial law for another year and allowed the killing of Helots without penalty. As part of the Agoge (military training), young Spartans were enrolled as members of a secret organization called Crypteia. Their task was to go out at night, kill any Helots they encountered, and take their food. This activity was designed to train Spartans to travel by stealth at night and keep the Helots fearful. The care with which Sparta protected itself are not surprising when one realizes that its army was perhaps 10,000 strong while the Helots numbered 220,000. 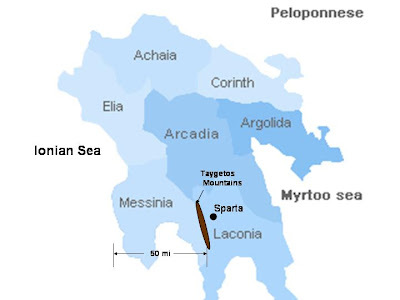 Spartan control continued for another 200 years until 464 when an earthquake struck the city. Once they realized the number of casualties (reported to be 20,000), the Messenians took the opportunity to revolt en mass, and it took four years to put down the insurgency. The Helots were finally liberated for good in 371 B.C. The info regarding the Helots is quite interesting, but also mention that Lycurgus was the one who took the necessary steps to keep the Helots under subjugation.